Lots and lots and lots of Smarties! First I covered each sponge with chocolate frosting followed by a sheet of fondant icing. 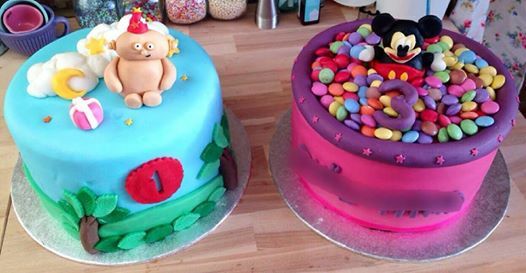 For the Makka Pakka cake, I coloured the fondant blue, and for the Mickey cake, bright pink. A tip I was given for colouring large amounts of icing like this is to colour a small ball of icing first, making sure its colour is brighter than you want the final colour to be, then knead this small ball into the rest of the icing. I love this way, as it is much quicker and the end product ends up much less streaky. After this, I used more icing and even more colours to decorate the two cakes! I used leaf cutters and star cutters to decorate the Makka Pakka cake to look like a garden and the sky, before adding some clouds and a fondant Makka Pakka to the top of the cake. For the Mickey cake, I recruited a good friend of mine who usually comes to the rescue when my baking doesn’t go to plan, to help me make a Mickey from fondant icing – which turned out to be much harder than we first thought! Once we conquered this, I rolled out a long thick tube of purple icing, lined the cake with it, placed Mickey in the middle and then poured Smarties around him to make the cake look like a big ball pool. And that’s it! Making two cakes in one evening was definitely a challenge, but once I heard that the two girls were sisters, I was very glad to do it. Hi, I’m Beth. I’ve been baking for FCFK Hackney for about a year now, and began after I graduated from university. It has been a bit of a crazy year, but I really enjoy taking the time to bake, and love to challenge myself with new cake designs. I definitely wouldn’t have the opportunity to make cakes like this without FCFK Hackney, so I am grateful for the opportunity! « Where the hell have we been? !